With summer a fading memory, hiking might be far from your mind. But don’t pack up the kids’ hiking boots just yet. Autumn is a terrific season to hit the trail. Our wildlands are bursting with fall color this time of year — hues of flame red, bright orange and soft yellow. Summer crowds have dwindled, and pesky mosquitoes have disappeared, too. Critters such as marmots and songbirds are more active and visible as they hurry to find food for the long winter ahead. With a few extra layers for warmth and the lure of a thermos of hot cocoa, your little ones will find fall hiking to be full of brilliant color and natural exploration. 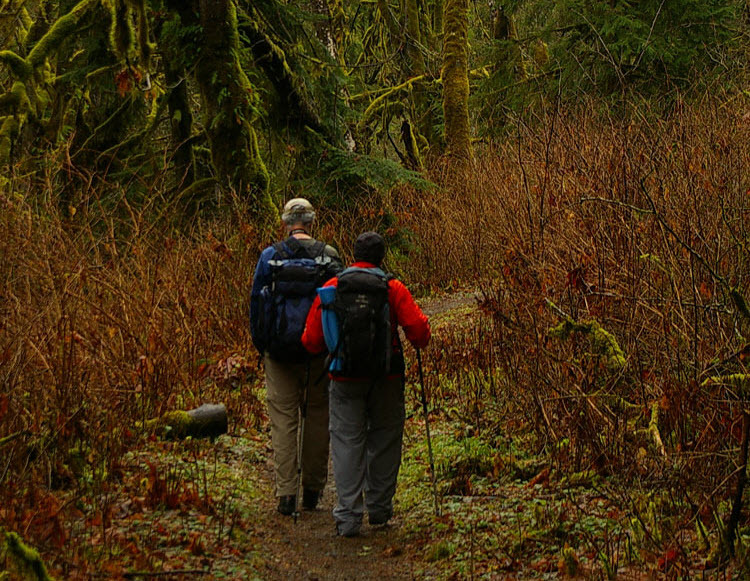 Read on for eight fantastic fall hikes in the Puget Sound area, or scroll to the end for more great family hikes. Distance: 2 miles round-trip, 300 feet elevation gain. Directions: From exit 34 off I-90 (about 31 miles from Seattle). Turn right at the end of the exit ramp, and proceed a little more than half a mile to S.E. 159th Street. Continue another half-mile to the Twin Falls Trailhead. Find directions and more information on the WTA website. Description: One of the classic family hikes in our region and accessible year-round, Twin Falls is particularly pretty in October. Big leaf maples mixed into the mostly coniferous forest are responsible for much of the subtle fall color along this kid-friendly hike to two waterfalls. Moss in many shades of green contribute nicely to the autumn palette as well. Directions: Drive Highway 20 east from Interstate 5 to the trailhead at Rainy Pass. Drive time from Seattle is about three hours one-way. You need a Northwest Forest Pass to park or pay $5/car. More information on the WTA website. Description: This classic kid-friendly hike in the North Cascades is dazzling when saved for autumn. Late-season huckleberries cling to fire-hued bushes along the trail, and wide-open vistas remind you of why you live in the Northwest (despite the winter that is just around the corner). 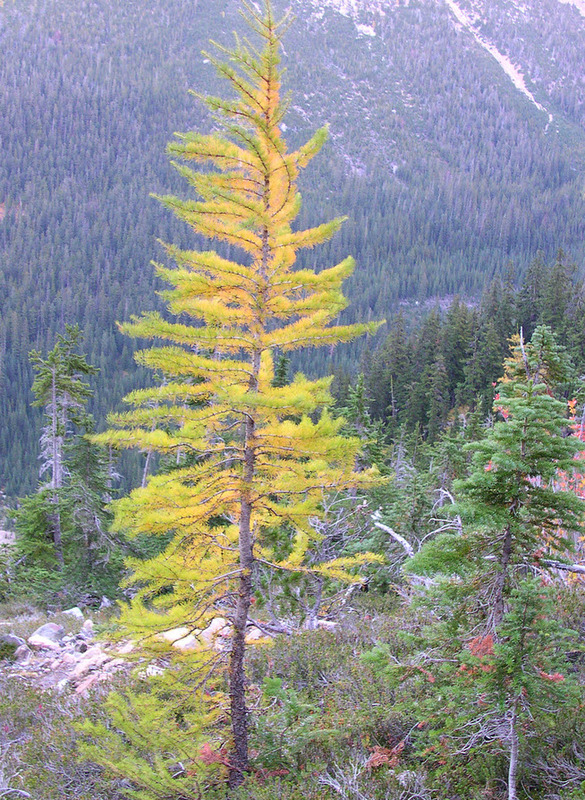 The star attraction of this hike, however, is the flame yellow of the autumn alpine larches, which are usually at their peak in mid-October. A short distance from the trailhead is a junction; head to the right off the paved path and onto the trail. Ascend through a canopy of conifers. At 1.3 miles is a side trail to beautiful Lake Ann, a perfect destination for families with small children. Relax at the lake and enjoy the views of granite peaks and golden larches before turning around and returning to your car. Directions: Drive Highway 2 east from Skykomish 1.8 miles, then turn right onto the Foss River Road (#68). At 1.2 miles, keep right at the fork. At 3.6 miles, take a left onto Tonga Ridge Road (#6830). At 7 miles from that junction, turn right (#6830 or #310) and continue 1.4 miles to the trailhead. You need a National Forest pass to park. More information on the WTA website. Description: Known as the easiest ridge walk on the west slope of the Cascades, Tonga Ridge is also one of the most popular in late summer. Fall will afford you some solitude to enjoy the fiery huckleberry and heather meadows in quiet peace. Hike to Sawyer Pass or as far as your kids wish, then turn around. Keep an eye out for deer and bears (wear bright colors! ), and don’t miss the gorgeous views into the Cascades on a clear day. Description: Want to feel like you’re walking on top of the world? Paved and gentle, Hurricane Hill is the ultimate autumn stroll for small children, even when in strollers. There’s no huffing or puffing required to immerse yourself in colorful alpine meadows of orange and gold, or see marmots and deer frolic nearby. Panoramic views on a clear day include the likes of Mount Baker, Vancouver Island and Olympic peaks so close you can almost touch them. Once you reach the hill (and the end of pavement), just turn around and walk back. Directions: Drive east on Highway 410 from Enumclaw to the junction with State Route 123. Go left to continue on Hwy. 410 for 3 miles to the trailhead. Note: You'll need to pay an admission fee to enter the national park. More information on the WTA website. Description: Fall color abounds on this easy loop hike that skirts the eastern boundary of Mount Rainier National Park. The trail begins in the subalpine zone, where open meadows carpeted with huckleberry bushes look like they’re on fire from all the red and orange hues. What could make such a scene even more beautiful? The constant backdrop of “the mountain.” Hike the loop in a clockwise direction for the best views. Directions: From Lake Stevens, drive SR 92 (Granite Falls Highway) to Granite Falls. Continue through town to where the arterial turns left and instead turn right onto S. Alder Avenue. After three blocks, make a left onto E. Pioneer Street / Menzel Lake Road. Drive through the rural countryside, watching for the sign announcing Waite Mill Road — that’s your left turn. Continue on Waite Mill Road to just past the school bus turnaround, then veer left onto a narrow gravel road that climbs uphill to the trailhead. More information on the WTA website. Description: Step into this mossy canyon where lush emerald ferns are layered against soft yellow and orange maple leaves, creating an autumn palette that is quintessentially Northwest. Bring a zoom lens to capture the more subtle signs of fall with your camera, like wispy chartreuse lichens wrapped around branches and rust-colored fungi clinging to tree trunks. Kids will enjoy this easy hike along the south fork Stillaguamish River (“the Stilly” as locals call it) for its rich history linked to limestone mining and the long-gone Everett to Monte Cristo railway, first built in the 1890s. Artifacts of this era are left all along the trail, from moss-cloaked saw blades to old bricks and rotting worker boots from centuries past. The well-signed trail starts in quiet forest and joins the Stilly about 1.5 miles in. From there it’s one more mile to the 20-foot tall old lime kiln, the highlight of the hike. This kiln is where calcium oxide was extracted from limestone for use in Everett industries. Turn around here or continue another mile to the trail’s end where a river bank vantage point invites you to look for spawning salmon. Directions: From Snohomish, take Lincoln Avenue south from the southeast edge of town; this road becomes the Old Snohomish-Monroe Highway. Continue for 2.7 miles, turn right (south) onto 127th Avenue S.E. Continue 1.6 miles to the park entrance and trailhead. More information on the WTA website. Description: Close enough for an after-school hike, wild enough to leave the city behind, Lord Hill offers an autumn respite near home for urban hikers and equestrians. The park comprises 1400 acres of upland nature preserve along the Snohomish River, with more than 5 miles of designated trails that criss-cross the old homestead. Varied river, forest and pond habitats support a lot of wildlife here that are more active in autumn, including bears, bobcats, beavers, birds and garter snakes. From the parking lot starts a main trail, first on boardwalk then on regular trail tread, and short loops can be created from side paths that branch off from it. Use the map to create a loop of your desired distance; the trails are well-signed. For a varied path with great fall color and possible wildlife sightings, hike the Beaver Lake Loop: from the main trail, turn left on the Beaver Lake trail, right on the Pipeline which takes you past the pond, then return to the main trail via the short Pipeline Connector Trail. Directions: From I-5, drive State Route 18 eastbound to Covington and exit at 272nd Street (Kent-Kangley road). Pass through Covington and Maple Valley. Soon after crossing State Route 169 (Maple Valley Highway) you’ll take a left onto S.E. Summit Landsburg Road. At 4.4 miles you’ll come to a stop sign; turn left onto Landsburg Road S.E. Continue down the hill, cross the Cedar River (you will see a slalom course set up in the river here), and park in one of the spacious lots on either side of the road to access the trail. More information on the WTA website. Description: Often thought of as a bike path, the mostly-paved Cedar River Trail makes a splendid fall hike too, especially for those pushing strollers or in wheelchairs. Another bonus — the trail’s finished surface won’t have the mud that often mucks up dirt trails in the wetter months. 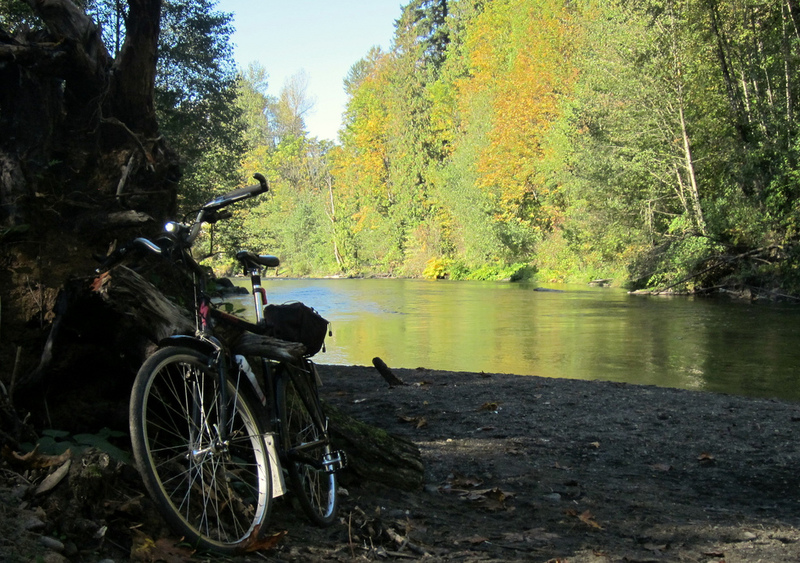 Following the old Seattle to Walla Walla railway route, the Cedar River Trail stretches from the shores of Lake Washington in Renton south through Maple Valley, and continues as soft surface (crushed gravel and still barrier-free) on to Landsburg, 17 miles in all. Some stretches of the trail feel urban and are close to RT 169 while others, especially the portion between Maple Valley and Landsburg, are more secluded and natural. Along the way are remnants of the old railroad which used to carry trains hauling coal from local mines. You can access the Cedar River Trail from many places along its length. For this autumn color hike, we recommend starting at the far eastern end in Landsburg for an afternoon of easy exploration along the treed river bank. From the trailhead at Landsburg Park, head west on the crushed-rock trail, strolling for as long as you want, then turn around and return to your car. For a 2.6-mile round trip hike, continue all the way through Big Bend Natural Area Park, then turn around at the large trestle bridge that spans the river. 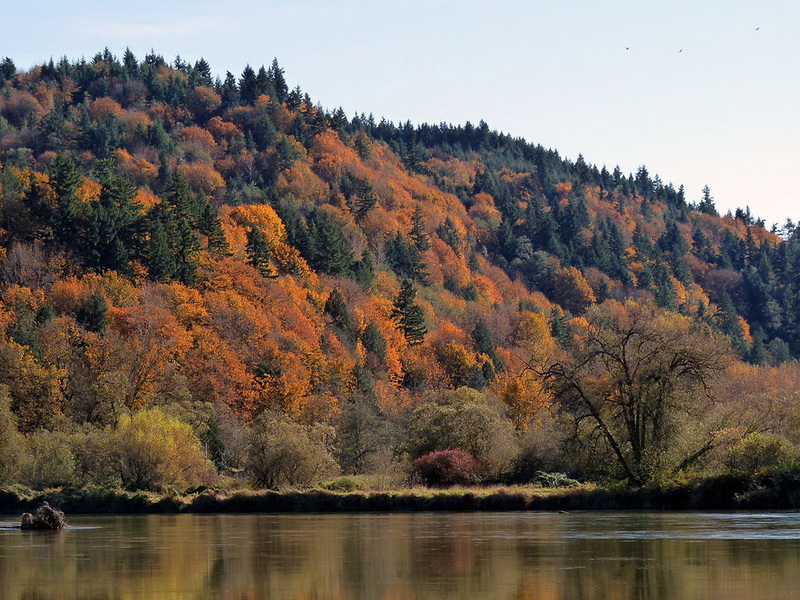 In fall, deciduous trees like big-leaf maple and vine maple add punches of orange and red to the riparian landscape. You can spot the fall run of sockeye salmon migrating up the river here to spawn--several bridges along the trail offer a vantage point.